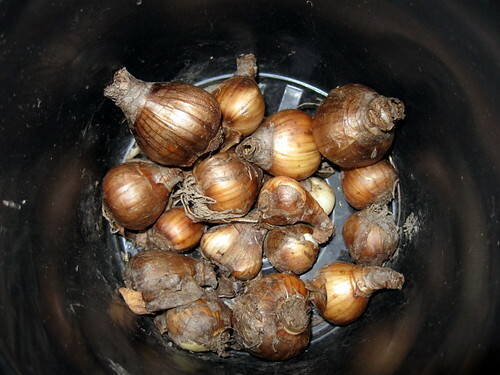 Everyone knows that fall is the time to plant many of the bulbs that will bloom in the spring. All the stores are now carrying daffodils, tulips and other bulbs and catalogs are sending out the bulbs you ordered this spring. But fall is also the time to plant other plants for next year’s garden. TheGardenLady just received a mailing from one of her favorite online rose companies The Antique Rose Emporium reminding me that fall is probably the best time to plant roses if you live in zone 6 or warmer. Roses planted in the fall acclimate quicker and perform better the following spring. Also, this is a great time to get plant bargains especially in your local nurseries. Friends of mine have found wonderful roses at discount prices at some of the big box stores that sell plants.Fall is the time for digging and dividing herbaceous peonies and can be done anytime through early November, according to Cricket Hill Nurseries. For detailed instructions on dividing and planting herbaceous peonies, go on their website. This is also the time to plant tree peonies. Buy and plant pansies now if you want to get two seasons of flowers from one planting of pansies. These days it seems that you can no longer even find pansies in the market in the spring. Pansies prefer cool weather so choose a spot that will be cool and moist in the spring in order to have the pansies stay in bloom longer next year. shasta daisyRemember that plants grown from seed won’t necessarily look like the parent. You can not propagate cultivars from seed.Before you plant the seeds, prepare the bed well. Work plenty of organic matter into the soil to help with moisture retention. Cover the seed bed with a light mulch. You can use newspaper as a mulch but when germination starts, remove the newspaper. The six weeks before the first hard frost is the ideal time to plant all kinds of things from cool-season veggies, turf grasses and perennials to both evergreen and deciduous trees and shrubs. The fall planting time usually occurs from September through October and for some plants, into November.